School spirit and tradition are at the forefront of the minds of students, faculty and alumni as Dakota Days approaches. Whether it’s planning events or ensuring student safety, several organizations are involved in preparing the weeklong homecoming festivities. Jessie Sadlon, a senior medical biology major and overall chair of the Dakota Days committee, said planning begins as early as November the year before. 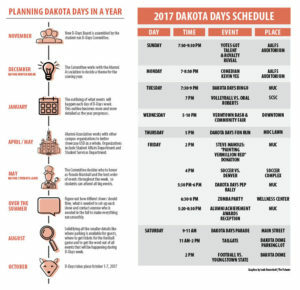 Student life also helps plan Dakota Days. 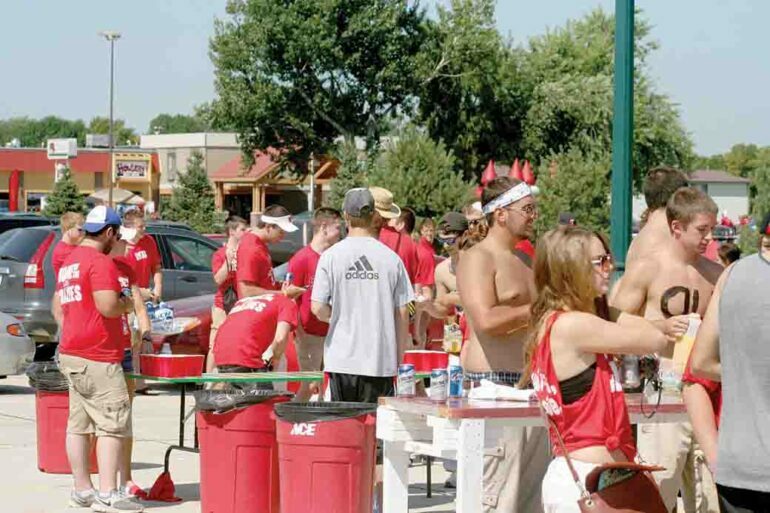 Kim Grieve, dean of students and vice president of student services, said most events are planned by the Dakota Days committee, but student life helps by incorporating some alcohol-free events into the week. “We have a Zumba party that goes through the Wellness Center and the Wellness Center planned Dakota Fun Run, so just some other things the students have an opportunity to be involved in,” Grieve said. Many Dakota Days events remain constants from year to year because of their historical significance, Grieve said. The Alumni Association and USD Foundation are also very involved in planning Dakota Days events. Michelle Green, vice president for constituent engagement at the USD Foundation, said their planning begins in April or May. Green said they also try to have a schedule mapped out by the time everybody leaves in May. During the summer the Alumni Association “gets to dig into the details” by talking about show flows and event setups. The Alumni Association’s signature event is the alumni achievements awards banquet that takes place on Friday of Dakota Days. Green said this year they’re presenting awards in the following categories: service to the university, public service, professional achievement and emerging leader. Dan Gaston, senior associate athletic director, said when it comes to preparations for the athletics department, they bring in more help wherever they can. “Concessions staff up and everyone is always worried about the restrooms,” Gaston said. Gaston said the homecoming game is really no different than any other game, other than its high attendance. 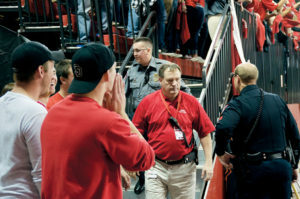 Jef Rice, University Police Department lieutenant, said UPD’s main priority during Dakota Days is remaining visible. Grieve said she wants everybody to remember what they learned at the alcohol trainings in the residence halls and at the safety training during orientation. Grieve said the entire university is involved in making the week as wonderful as it can be. “The students are involved, the staff of student life is involved, the Alumni Foundation are involved with getting the grand marshall for the parade,” she said. Green said the week requires collaboration from all departments on campus.